One of the most challenging subjects of stochastic analysis in relation to physics is the analysis of heat kernels on infinite dimensional manifolds. The simplest nontrivial case is that of thepath and loop space on a Lie group. In this volume an up-to-date survey of the topic is given by Leonard Gross, a prominent developer of the theory. Another concise but complete survey of Hausdorff measures on Wiener space and its applications to Malliavin Calculus is given by D. Feyel, one of the most active specialists in this area. Other survey articles deal with short-time asymptotics of diffusion pro- cesses with values in infinite dimensional manifolds and large deviations of diffusions with discontinuous drifts. 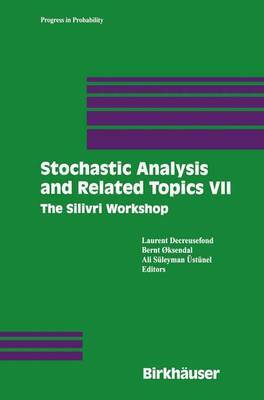 A thorough survey is given of stochas- tic integration with respect to the fractional Brownian motion, as well as Stokes' formula for the Brownian sheet, and a new version of the log- Sobolev inequality on the Wiener space. Professional mathematicians looking for an overview of the state-of-the- art in the above subjects will find this book helpful. In addition, graduate students as well as researchers whose domain requires stochastic analysis will find the original results of interest for their own research. The organizers acknowledge gratefully the financial help ofthe University of Oslo, and the invaluable aid of Professor Bernt 0ksendal and l'Ecole Nationale Superieure des Telecommunications.